I knocked my fuel cap into the drink while fueling this weekend. 2006 Main ship Pilot II. It’s a 1 ½” diesel flush mount 316 SS . I think it’s NPT thread? Straight thread will not fit. Went to marina and West Marine and all they have it straight thread. Attwood # 66061-3. Anyone have this issue? Can I just order another cap or do I need to replace the entire deck fill fitting? Does it seal with a o ring? If so it must be a straight thread. I cannot see it being a pipe thread. Is there a better, more complete marine store in your area? That issue drove me crazy for the whole fifty years I sold marine hardware. Some of the caps were straight pipe thread, some were just what ever the manufacturer wanted to use. If I did find one that fit, it would often stand proud of the fitting. Other times it would recess down where it could hold water. Is there a mark on it that tells you who made it? Might be under the flange. If you have to remove the fitting to figure out who made it, I’d probably just buy a new fitting and a spare cap. If you do manage to find a cap that fits, buy two. Russell, it does have an o-ring and I would tend to agree with you since I know the seal on a NPT is on the thread face. But you can see a lean to the thread that the straight thread does not have? HopCar, I have looked online for hours and it is confusing. Now I did find a 1.5" NPT on go two marine. 71 bucks just for a cap. I can buy a complete deck fitting for 1/2 that price. That makes me think it may be the one I need. Since it seven times the price of other caps?? Of course that’s the one! If you had a spare aboard you’d never have lost the first one. Does your holding tank cap match it? If so use it on the fuel fill with a suitable O ring. When I gave my Perko water cap a swimming lesson I ended up replacing it "temporarily" with a plastic cap from West Marine. It's not fancy. It sticks up from the deck. But it works. I believe I paid $1.50 but it might have been $3. This is temporary, until I find $50 for a "real" one. Additionally, this is my water tank so I don't have to be quite so careful as you with fuel. However, if I was going to use this for fuel, again temporarily, I would buy an o-ring that fits the threads and use that. Theory: Something is better than nothing. One more thing: Mine has a wider thread than some. I did buy a knock-off cap and it has a finer thread count. The cap won't spin on fully. Sorry to hear about this -- I'm always nervous about losing my cap too (same boat as yours) and will be interested to see what you find. Just curious -- I'm sure you thought of this, but it wasn't possible to retrieve the lost cap? Those caps are pretty heavy so I imagine it would sink straight to the bottom from where it went over. You might check the bottom of the flange to see if you can locate a part # to confirm the above and/or give Whitecap a call to confirm their thread & dimensions. 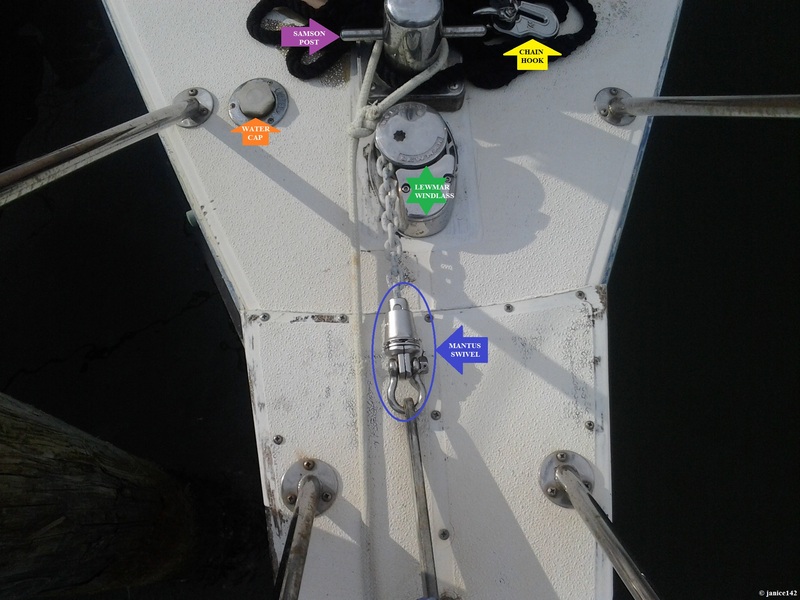 I have made some assumptions in the above logic but if yours looks similar it might give you a worthwhile lead...Hope that helps - I recently almost did the same thing - unscrewed cap and found the screw had come lose where the chain attaches - fortunately both the cap and screw settled on the gunwale - whew! and was able to resecure the cap / chain. I need to get "add locktite to fill chain screw" on the to do list. If you want you can also scan through the part pics for MS models other than the 34T/HT from a link on my "Bacchus" website. Thanks for the information Bacchus. Picture looks like the one I have except it says diesel and not water. I did see the white cap industries on line. It maybe a Perko? The White cap is much cheaper than the Perko. Still looking, I need to go back down to boat. . I will ID soon I hope. Perko doesn’t make stainless deck fittings. Theirs are chrome plated brass. Whitecap sells high quality imported stainless fittings. I was able to find it online but it doesn't list a spare cap # or the thread specs - at least the Whitecap listed complete info re: size / threads. If you can confirm thread size / type - straight pipe via dia & TPI that could help. Edit: Looking at the 2 pics I posted the style of the indicator label might be a clue re: which you have - Gem engraved lettering ( listed as 2") - Whitecap etched relief but lettering is same polish as surrounding flange?? Well that's not as clear as I thought - WHitecap has both styles in their catalog as well as both 1-1/2" and 2" hose sizes so need to check more carefully. A call to Gem might also be worth trying to confirm threads and whether a cap is available separate. I'm surprised MS would go to different sources for similar items but I guess it is / was all about lowest cost and that might have varied year to year. Let us know what you find and resolution for future reference. Picture looks like the one I have except it says diesel and not water. . It looks like the cap says nothing but the fill neck has the writing. When I looked up Gem Products their catalog doesn't even list Deck Fills - fuel or others. Do you know if they are in the habit of dropping products frequently. I did find some of the Diesel Fills online but they were at dealer / distributors... guessing stock on hand? It looks like Whitecap has a very complete line of deck fills and a few replacement caps. - thanks for confirming their quality. Thanks to Bacchus pointing me in the correct direction. After emails, phone calls and purchasing three different caps or fills I got the right one. Whitecap was the answer. Diesel deck fills 6124B was the correct fit. I also looked at the waste and water deck fills and they seem to be Whitecap also. So if you lose any caps start your search with Whitecap. Glad it helped & thanks for confirming.